MySoapBox is a site devoted to product research. Consumers answer survey questions, providing feedback about their experiences with various products and services to help companies make improvements to their offerings. in exchange for their opinions, users are rewarded with points that can be used to purchase gift cards usable in a wide variety of well known stores and restaurants. Is This a Reputable Site? MySoapBox has a pretty decent reputation compared to the average survey site. Some people have had issues, which I'll mention below in the feedback section, but it is certainly possible to earn points and redeem them for real prizes through MySoapBox, and there are many people who've been using the site for a very long time with no complaints whatsoever. Anyone over 13 years of age with a valid email address is technically welcome to join the site. I found the signup procedure for MySoapBox was actually pretty involved. In addition to providing them with a valid email address, and answering all the typical questions about your location and age, you have to give them your phone number and then let them call you to provide an access code. When you get ready to sign up, make sure you have a phone handy, and that you're in a situation where you can take a moment to answer a call. Before you begin using MySoapBox, you'll have to do a preliminary survey (for which you actually earn points) where they'll collect all sorts of important demographics information, such as the size and makeup of your household, your race, and your income level. There's one thing I noticed during this survey that I feel you should pay close attention to. At some point along the way, they'll ask a few questions about whether or not you're interested in receiving phone calls with special offers or answering telephone surveys. I can't remember the exact wording, but there was a list of options related to things like this with the check-boxes already selected, and you could either leave them that way or un-check them. My advice—if you don't want to get a bunch of calls from marketers, I would be careful about how you answer those particular questions. In fact, just keep an eye out all the way through the signup process for things like that. Anyway, once you've completed your demographics survey, everything else is pretty simple. You just log in any time you want, click the SURVEYS link on the top of the page, and you'll see a list of available questionnaires, with point totals next to them so you can determine the value. You’ll also receive emails when new surveys are available. There may be long stretches of time when you don’t qualify for many surveys at all, but if you log in every day, and take whatever opportunities are available, you'll gradually begin to accumulate a significant number of points, which you can use to purchase electronic gift cards from many different companies. 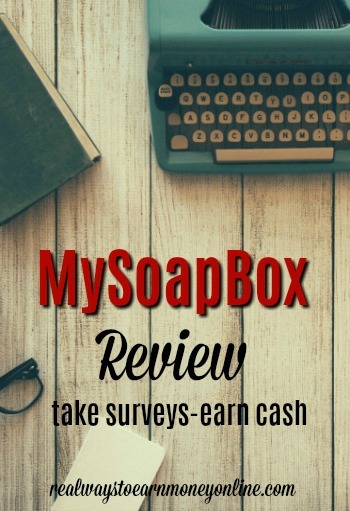 Like most survey sites, MySoapBox is only good for earning a little bit of extra pocket change. You’ll never make a living through this site, but you might eventually gain enough points to claim a few neat prizes, and for many people that’s enough to make it worth the effort. Before you can even begin earning rewards, you have to get 25,000 points, which is a fairly daunting number. However, once you've made it over that hurdle, the actual point-totals required to purchase gift cards aren’t really all that bad comparatively. In some cases you can purchase cards for as little as 1000 points, but that won't get you very much store credit at all. The exchange rate as of this writing seems to be 1000 points per dollar, so if you want something really significant, like a 50 dollar card, it will take quite a long time and you'll have to do a large number of surveys. I used Survey Police to get a broad look at user opinions regarding MySoapBox. This company has been around for quite a while. I found reviews going all the way back to 2013, and the overall opinion during all those years seems to be fairly positive, with a sprinkling of dissatisfied people here and there. Most of the complaints had to do with the issue of getting disqualified for surveys over some demographics issue or another. This apparently happens very frequently, especially for users in certain age groups, and this complaint has been a common issue going all the way back to some of the earliest reviews. So unless you fall into the right demographic niche (apparently younger people do a little better) it might take a long time to work up many points. On the positive side, I didn’t see too many people complaining about an inability to claim rewards or anything really dodgy like that, so I don’t see any valid reason to distrust the site. It doesn’t appear to be scammy or disreputable. If you're the sort of person who enjoys taking surveys, and you think MySoapBox sounds like something you’d be interested in, then head on over to their website and get started. Looking For More Ways to Get Paid For Your Opinion? If you want to join more survey panels that are legitimate, be sure to check out my e-book, Your Guide To Taking Paid Surveys For Extra Cash, now available on Amazon for just $2.99!